Forty-one years ago, the Internets were created. There have been many twists and turns, but there can be no question, that all the tumult was leading to a single creation. That creation is the below video. My favorite bit of research recently is basically to just draw a big circle around an anomaly and figure out what it is. The problem, of course, is that this leads to a lot of correlation without causality, so I offer this up with no analysis whatsoever. Interesting – out of the 20 top cities (over 100,000) by crime per capita, 18 have Democratic (or Democratic-leaning non-partisans) as mayor. The stat I do not have here, which is critical, is the percentage of mayors that are Democratic, but I doubt it’s over 90%. 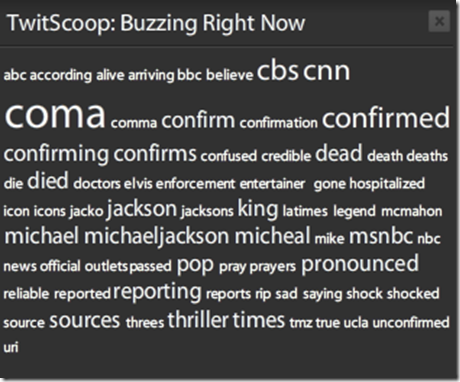 I’ve never seen anything like this – the ENTIRE twitter-verse is posting about Michael Jackson dying. 100% of Twitscoop is MJ related – crazy. My favorite new religion is The Great Magnet (jump on that page and contribute, it’s my first Wikipedia article ever!). I’m a HUGE fan of the Adam Carolla Podcast and I heard him talking about this the other day. I won’t go so far as to call it a religion (as an atheist, he doesn’t believe it’s a religion either, but he positions that it’s as close as you can get to him believing in religion). The Great Magnet (n): The theory that as you become aware or start thinking about certain things, you are more likely to encounter similar things. Example, I have a bowl of Mac and Cheese for dinner and think it’s great. The next morning, The Today Show is talking about making killer Mac and Cheese, and then in the afternoon I read an article about how bad carbs are for your heart. I'm in the process of setting up a cool Slingbox, but the stupid cable box doesn't respond as it should. According to this post, the Pace TDC577X actually should be listed as a Motorola DCT 6412. Thank God for the Interweb, or I'd be trying to figure this out for hours! I don't know who I'm more mad at here... Slingbox for not updating your DB, or digital cable providers for not having a dead simple USB interface that all devices can talk to. Come on! I hate reading in bed. Actually, let me correct that. I hate reading in bed in the way I currently read in bed. I can’t lie down because my arm falls asleep. I can’t sit up because I always slide down in some way, and my back feels weird. I’m a giant lazy complainer, but I don’t care, I want what I want. 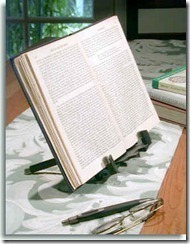 BookHolder isn’t bad, but seriously, you still feel the pain of flipping pages. Not to mention the fact that I don’t anything to hang over/near my head/groin that I’ve installed while lying down. BookGem bad either, but, AGAIN, I hate flipping pages, and it seems like every time I flip, I’ll have to deal with that page holder, and resetting the installation of the book. So, I gave up. Who could possibly solve this seemingly intractable problem? But it is often said that when looking for love, the first thing to do is stop looking. While browsing the xkcd blog the other day, I came upon EXACTLY the same problem. Could this be true? Am I in love? And here’s it is in action! Genius! 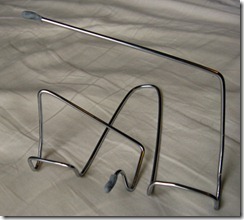 But the real AHA was that the problem with existing book holders was not the angle or position, it was the book. The irregular shape of the book, and the need for occasional access to the front (to turn pages) causes the difficulty. 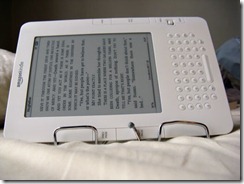 In fact, swapping the book out for the Kindle is the root problem, and makes the other devices nearly ideal as well. 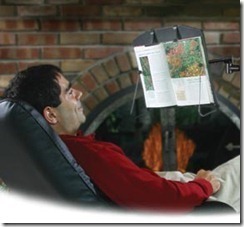 For example, te BookHolder (#1) would be fine with the Kindle – though I would still have the annoying raising my arms to turn the page issue. A small, but noticeable annoyance. I hope Mr. Munroe starts selling these asap! 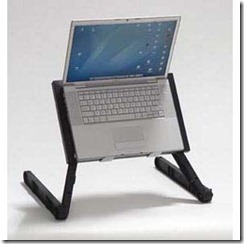 True, it’s for laptops only, but I love it. Right now, propping my knees into an inverted-v position provides this functionality, but this device is much better. The price point is a deal breaker … why is this worth $99? Well, the most recent flight on JetBlue wasn’t quite as good as I had hoped. Everything went great on the flight, but while I expected to watch the Thursday night lineup on NBC, instead I fell asleep for a fitful night’s rest – apparently getting older really does make it harder to fall asleep (and stay asleep) on the plane. In the olden days, I could curl up bent over on the tray table and sleep for hours. Now, my back already hurts. But walking out into the JetBlue terminal at JFK, they deserve SERIOUS commendation on having an end-to-end brand experience. Gone are the totally generic chairs, walls, etc, with customized and very nice looking ports for laptops, food, markets – even customer service. Great look, giving the right stuff away for free (wifi, power), appropriate layout (food in one place, that doesn’t feel like a communist market) – I must say it must have been difficult to put together an ROI on this, but it’s worth it for me. And they’re not even paying me. In fact, I’m paying them! Now if I could only find a replacement power cord for my laptop. My wife just ran a half marathon… which is about a half marathon longer than I can run. 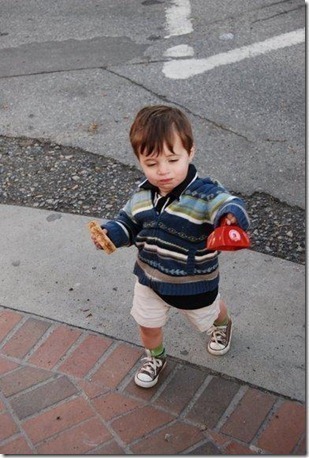 Oh, did I mention she just gave birth to our SECOND child in as many years six months ago? We had a little dude on the scene for support. Go mommy! Oh, also... Go peanut butter and jelly!